Wakefield Trinity Wildcats have signed Bill Tupou from Canberra Raiders but back row Matt Ryan has left the club. Tupou will be at Trinity until the end of the season and will be eligible for Sunday’s Super League clash with Huddersfield Giants. The 25-year-old, who can play centre or wing, started his career at the New Zealand Warriors, making his debut in 2010. He made 62 appearances before joining Canberra Raiders in a mid-season switch from the Warriors in 2013. Tupou has scored 22 tries in the NRL and was selected in the New Zealand squad for the 2011 Four Nations. He represented the Tongan National side in 2014 in the Test against Papua New Guinea. 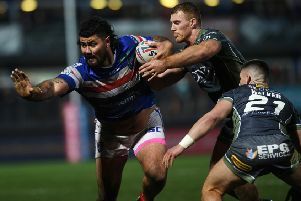 Tupou said: “I am extremely excited about the opportunity I have here at Wakefield Trinity. The club has also revealed that back-rower Matt Ryan has left Wildcats with immediate effect.